I can still feel the sting of the tears as the North Sea wind catches my eyes, for when I was upset, tears would trickle down my cheeks, and I would feel them slowly descending towards my lips. I wonder if Shakespeare knew what I have discovered and shared? That the whole body can hear? Reading his work, I could almost feel the sound of the pen scratching at the paper – etching out the narrative in such a way, sound becomes paramount to the play. Each character echoes sound, and Shakespeare entices us into their tales, using sound to colour their characters. For me sound is about depth of feeling. I have found a way to substitute for my hearing loss. I immerse myself into the senses within my skin, bones and muscles. I discovered a whole new set of hearing tools through ambient vibration. Shakespeare’s The Tempest plays to my sensory world. He uses sound to describe emotions: humour / pride / anguish / shame / authority and subservience – throughout the tale. For example, Antonio, who we are told usurped his brother’s position, shouts at the sailors, ‘Hang, cur! Hang, you whoreson insolent noise-maker!’3 Now I am tempted to replicate the emotions’ meanings through my percussion instruments! The use of sound colours what we most enjoy as the play unfolds. I wonder if actors relish the opportunities to express themselves through the sounds of the characters? I have spent most of my life encouraging people to engage in a richer world of sound, by tuning into the ‘pretence’ of silence. It is my belief there is no such thing as silence. To experience this we need to turn off all surrounding sound and contemplate the remaining chasm, which should be silence. You will discover thus another sound world, where you can truly begin to understand how to tap into a different way of listening. By putting your hand on your chest, you can feel your own beating heart. I have learnt to interpret those feelings throughout my body. Shakespeare slows the tempo down as he brings the gentle Miranda and Ariel to us. Miranda makes the profound statement to her father, ‘Your tale, sir, would cure deafness.’ Now I am really hooked! Curtsied when you have, and kissed. I imagine a twinkle or glint as Ariel flits from pillar to post, weaving in and out of the players, singing his song, while Ferdinand, son of Alonso, the King of Naples, asks, ‘Where should this music be? I’ th’ air or th’earth?’7 I like the idea of music being around and within us. I have spent my life learning to experience sound to enable my body to transfer the impact of the feelings I get from sounds, which most hear via the ears, to my brain. How can I deny Shakespeare intended us to read the most musical sounds into his play when he presents us with the second verse of Ariel’s song? I reach for yet another bell to accompany his words! 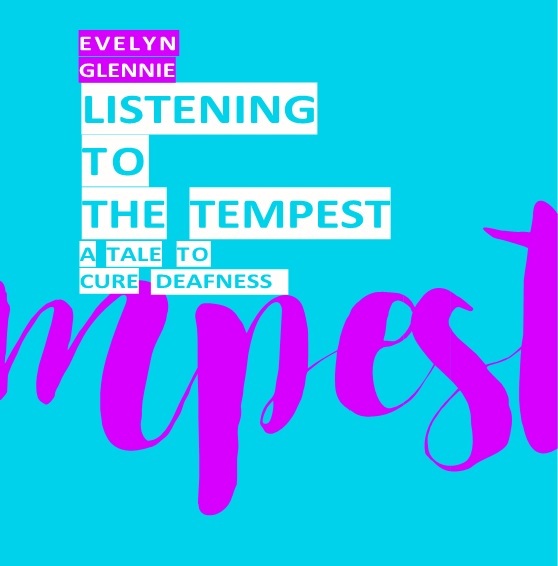 The Tempest is a vibrant mix of many sounds of land and sea and wind and surf. Rhythm is present throughout the text and lyrics. Passion is deeply embedded within the emotions. I am perhaps more sensitive to the passion and emotion of sounds because of my hearing loss. I have had to learn what each sound represents, rather than taking them for granted. My whole body is similar to an ear, every surface has learnt to become a conduit, bringing meaning and sense to my brain. Whereas Shakespeare crafts his words, I sense he is wanting his audiences to experience them in their completeness. He uses his wordcraft to immerse and engage us, as if we were actually participating in the play. ARIEL: Hark, now I hear them. Shakespeare leaves us to imagine the horrific sounds of the storm that left King Alonso, Sebastian, Antonio, Gonzalo, Adrian, Francisco and members of the crew stranded on another part of the island. For me there is a space to imagine instruments I might select to recreate the sound of the waves crashing onto the wooden decks of the predestined shipwreck. I feel the creaking of the wood as it breaks on the rocks, slapped by the canvas sails splitting the rigging. I ponder, and reach for a mallet; I grasp the wood firmly. As I embrace the scene, it is the same as when I raise my arm to strike the bar. As soon as my arm falls, it is that moment the waves begin to crash onto the rocks – that place of no return. The mallet will strike and the waves will crash. I consider the rhythm of Fernando’s arms thrashing, time and time again, against the water that threatens to drag him down to depths, ending only when the pressure of the water exhausts his final breath. I am reminded of the way a frantic musical performance comes to an end: I catch my breath and bow. But Shakespeare wants not for glory, in this scene he is asking us to experience loss. The waves are deadened and quiet and have left their trail of destruction, lifeless on the beach, with only the swishing hand of the ebb and flow to cover their shame. In those few words I feel the sound of a sword being dragged from its sheath, a sharp sound against the dead night, the air heavy with intent and surprise. Oh what magnificent sounds I should create to feel that sinister look upon Sebastian’s face as the King wakes from his slumber, and Sebastian’s evil intent is thwarted! ‘[A noise of thunder heard]. Apes’ chattering teeth, hedgehogs’ pricks, and adders’ fangs: I trawl my arsenal of percussion to find something to create these sounds. I want to offer a sound sense of his miserable existence, and to try and bring him a cheerful note. Perhaps Trinculo the jester can do that for me? I am propelled back to the 2012 London Olympics, where these immortal lines were performed. As I prepared for my own performance there, caught up with the moment, I felt separate but not alone. Later, the thought of the audience, both local and global, was brought home to me when I watched the ceremony on television. Through it all though, I held Caliban’s injunction ‘Be not afeard’ close to me, a distillation of my own raison d’être: to help others develop their own understanding of sound and listening. As I follow Shakespeare’s tale of love and forgiveness, I sense that Shakespeare, like me, loved life, honesty and friendship. Which pierces so that it assaults Mercy itself and frees all faults. Possibly the last words written by Shakespeare. He requests that his sails are filled and he is released. The tempest has waned, emotions are calm, and forgiveness abounds. He takes a bow and leaves the stage. It has been 400 years and his words are still spoken and recognised around the world. It is clear to me Shakespeare wrote from his heart, and he brought about honour, pride and reverence to his audiences. I admire his spirit and feel I know him through his works. Hope you do too! Published in collaboration with the British Council, The Open University and BBC World Service.